Witchblade is back with an all new feminist creative team. I enjoyed the original Witchblade, but I honestly didn't stick with it very much. 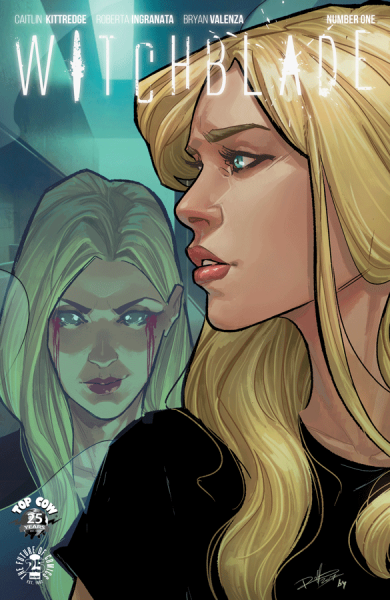 Witchblade #1 serves as a reboot with a brand new heroine, Alex Underwood, taking up the titular mantle. Alex is nuanced character with deep emotional trauma but with a clear moral resolve. Alex is a victim's advocate and is charged with protecting a woman that was abused by her husband. Additionally, the whole time the impending power of the witchblade is looming over Alex. From my prior experience reading Witchblade comics, I know what the witchblade is but here it was not really explained. New readers will probably have to Google witchblade to at least know what it is. The issue throws a lot at the reader, but it holds up well. For a first issue, Witchblade #1 dose a great job introducing a re-imagined character and setting up a plot for later development. Never do drugs. Just read comics. 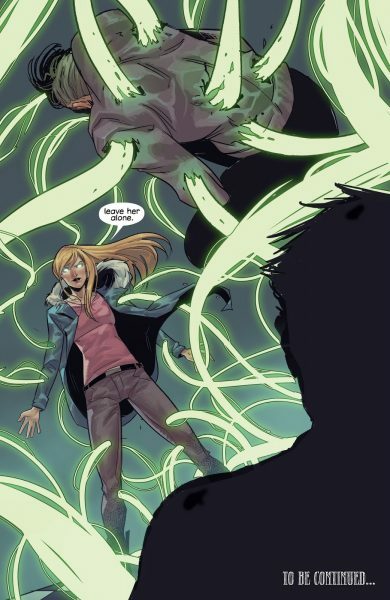 Witchblade #1 is a bit of an acid trip -- in a good way. The story goes back and forth through time and space, which can be a little hard to follow at times. But as I mentioned before, the plot manages to hold together. In fact, the phantasmagoria of images does good job of invoking Alex's trauma and delivers what it's like to have memories swirl together. This sleek art doesn't appear cluttered and it's easy to follow what is going on. The art also uses a lot of dark colors to give it a tone that old Witchblade fans can appreciate. I would much rather not comment on the feminist creative team but it was much touted in the initial announcement and in the ending interview. I'm very glad to see that the creative talent did not fall for bad feminist tropes that can ruin a female led book. A common trope is to make all the men weak characters in order to artificially boost the female lead. Sure, there is the abusive husband, but we also get introduced to another unnamed male character. He doesn't come off as stupid or weak and looks like he will play a role in helping Alex understand the witchblade. Alex is strong character thus far, and she doesn't need dumb characters to make her look good by comparison. Overall I liked this new take on Witchblade. I like Alex's nuanced personality and clear motivations. Here's hoping that transformed armor looks good when the witchblade comes into full play. I think old fans will like this new run if they don't come expecting Michael Turner artwork.